This page is about the Russian «Panther». 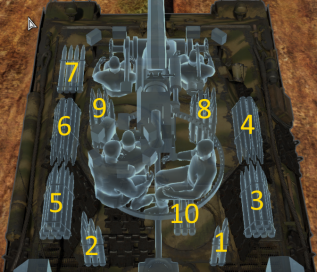 For other Panther tanks, see Panther (Family). The ▂T-V (also seen as «Panther» in-game) is a gift Rank III Soviet medium tank with a battle rating of 5.7 (AB/RB/SB). It was available as a prize during the 2016 "Thunder League" eSports tournament, first as a giveaway prize for watching the Twitch stream, but then every Dog-Tag owner for the tournament earned one when the tournament prize pool reached its $50,000 goal. Though it has the external looks and automotive performance of a Panther Ausf. 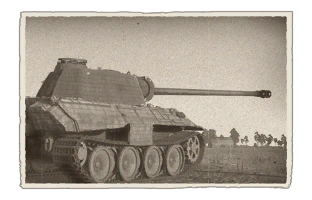 A, its firepower is of the in-game Panther Ausf. D due to the lack of APCR ammunition. Either way, as a premium Panther tank in-game, it can prove quite an opponent in the battlefield. As with all other Panther-series medium tanks, it is best played in a supporting role or as a front-line offensive Tank due to its agility. The cannon mounted is more than forgiving and powerful enough to destroy any potential target, so use it to the tank's advantage; Long-range shooting is effective as the muzzle velocity is extremely high, owing to the long-barreled 75mm, the penetration values are more than capable of punching through any opposing armour, and the shell weight will, if the Shell penetrates, consistently deal decent amounts of Crew and Module damage, if not immediately make the target on combat ineffective. This tank however, owing to its "Mailbox" gun mantlet design, is not good combatant frontally, especially at its BR; many enemy tanks will find the gun mantlet a juicy target. Never engage in extended frontal skirmishes with enemy tanks; instead, use the Panther's high mobility as much as possible. Don't stay in one place as much as possible, shoot and scoot before the enemy can react shoot through the mantlet. Suspension wheels and tracks are 20 mm thick. The interleaved suspension system allows the wheel to stack up, giving around 20 + 20 mm at places. 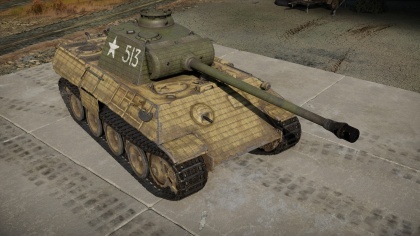 Unlike German Panthers, the T-V's lower side hull Schürzen plates are mostly missing. At the locations they exist on, they provide a 5 mm thick armour plate. In World War II on the Eastern Front, the Soviets captured many equipment from the German army that were either left behind or were repaired after being damaged in combat. The Soviets then used these captured equipment against their former users in the war. This practice is not exclusive to the Soviets, as the German military also used a variety of captured equipment such as Shermans and a variety of Soviet tanks. The types of equipment the Soviet captured were guns, clothing, materiel, and armoured vehicles. Some of the tanks the Soviets captured were hundreds of Panzer IIIs and some StuG IIIs, Panzer IVs, Panthers, and even the Tiger I and II heavy tanks. The Soviets employed some of the captured tanks into their combat ranks, such as the Panzer IIIs as the T-III, and even the Panthers under the designation T-V (or T-5). The Soviets usage of the Panthers in their ranks is actually quite rare due to a few reasons, the Panthers were difficult to maintain and added with the lack of logistics from the Soviet industry, there would be a shortage in spare parts, ammunition, and fuel. Several commanders in the 4th Tank Army have low opinion of employing enemy tanks due to these reasons and suggest that if necessary, make use of the Panzer IVs (T-4) instead for the same role. Nevertheless, the 4th Tank Army ended up using the Panthers tank in their own ranks, the only recorded usage of Panthers in a Soviet tank unit. The Panthers were given to most notably the 62nd Guards Heavy Tank Regiment and the 51st Independent Motorcycle Regiment. The Panthers in these units were only given if in intact conditions and were to be used until they broke down, to which it would be abandoned and the unit refitted with better, more reliable tanks. The units using the Panthers were very aware of the Panther's defects, especially the weak final drive that is the most common mechanical issue on the tank. Despite that, one incident reported that a Panther unit was able to travel 600 km through unfavorable terrain and battle before breaking down with an engine fire (The Panther's final drive's life expectancy was 150 km). The units did not suffer fuel deficiency due to their usage of other gasoline-run Lend-Lease vehicles, giving them more gasoline than a typical Soviet tank unit. The unit also solve their spare parts issue by simply scavenging a second, worn-down Panther for parts to fix a more intact one. There was an attempt to ease the ammo issue by adapting the turret to hold the 85 mm D-5 gun on the Soviet's T-34-85, but this did not go through, possibly due to the inevitable end of the war. In the battlefield, the Panthers were repainted with very prominent paint jobs and Soviet emblems to avoid being targeted by friendly units with a more common Soviet tanks such as the T-34s. The Panthers were used by the Soviets all the way up to early 1945. After which the remaining Panthers are either stowed away at collection points or sent to scrap yards. Romania received 13 Panther tanks from the Soviet Union in May 1946 and served until 1950. Skins and camouflages for the Panther T-V from live.warthunder.com. 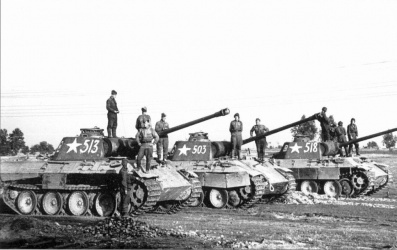 Historical photo of the Soviet-captured Panthers. Note that the very left one is the one seen in-game. This page was last edited on 21 March 2019, at 17:15.